One collector is using eBay to sell one of the largest and most complete video game collections in the world. Such a collection will set you back $550,000, as of now, and there currently is one bidder. After a life spent collecting video games I decide to sell off my entire collection. Just to give an idea of the huge amount of items present in my collection, I spent the last two months of my life taking pictures and making lists, working about eight hours a day just in order to make an inventory and to figure out what I have. Even now after all the time spent checking things I'm not sure to have included all in the lists. Due to the sheer amount of items is even difficult to present it, and I don't really know were to start... so I try to do my best even if I'm sure I might forget something. Instead to pick up some favorite consoles and maybe try to complete all the games related, I choose to collect most systems possible with the most representative and rare games for each console. This collection is the story of the videogames from A to Z, from the game & watch and old pong systems to the actual generation of PS3 and XBOX360. Games, Consoles, Controllers, Accessories, Promotional and various items. -The consoles are over330, with 307 system boxed and 24 loose, and even in this case we have all the different standards. That is a pretty impressive collection. The amount of time and money spent in getting rare games or even collecting all games for a system. 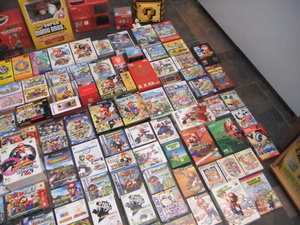 You think when his collection was small and started to get bigger he would start documenting all games, systems, and accessories. Very impressive. My collection is nowhere close to this but I like to think I'm getting there. Wife hates it but ah well. OH YES ... THERE WILL BE BLOOD. I'm not sure what happened but it's no longer present. 0 bids is what I saw. I'm hoping a museum bought it. You've got to consider that it's not just the collected worth of those games but the effort behind amassing it. I sort of thought it would be hard to sell. While it is an amazing collection, who has half a million to just spend on video games and consoles? The Powerhouse museum in Sydney Aust could have bought it (for instance).